I think it’s fair to say that Julia Donaldson is one of my kids favourite authors and I know that the same can be said of an awful lot of other children too. 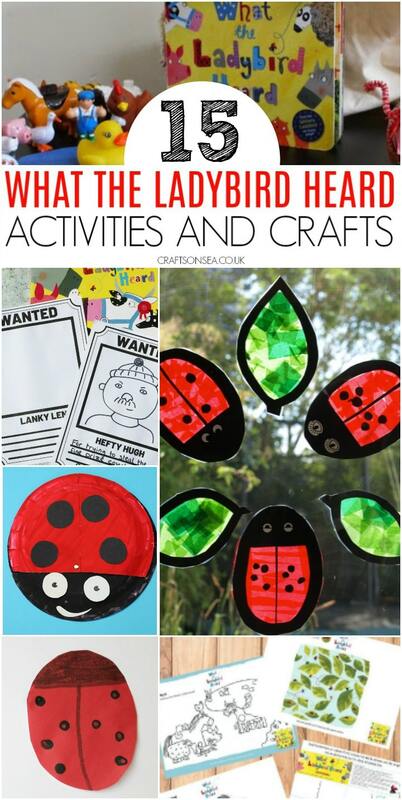 What The Ladybird Heard is one of our favourite stories (as well as the two sequels) and these What The Ladybird Hears activities and crafts are great either as extension activities for the books or just as a simple way to keep your child entertained and having fun. All the activities that I’m sharing today appear in the same order as you’ll see them in the collages. There are more ideas than are shown in the pictures though so do take a look through to see which you’d like to try and don’t forget to bookmark this page or pin an image so that is easy to return to at a later date. Love crafts and activities for kids books? You’ll find more ideas at the end of this post! Play and Learn Everyday have a great What The Ladybird Heard story sack that would be perfect for younger children to play with. Print off these free What The Ladybird Heard wanted posters and draw in Lanky Len and Hefty Hugh. There’s four different versions so you could change who you think should be wanted and there’s also room to add some writing if you’d like to use this as a literacy activity. This What The Ladybird Heard paper plate craft is made with movable wings so you could use the back area for some literacy work or you could hide a little picture there of what your ladybird heard! I love these ladybird suncatchers from Here Come The Girls which would look beautiful on display in a school or preschool window or in your childs room at home. I made these cotton bud printed ladybirds with my daughter when she was a toddler and the post also contains a few ideas for how you could change this activity for different age groups. 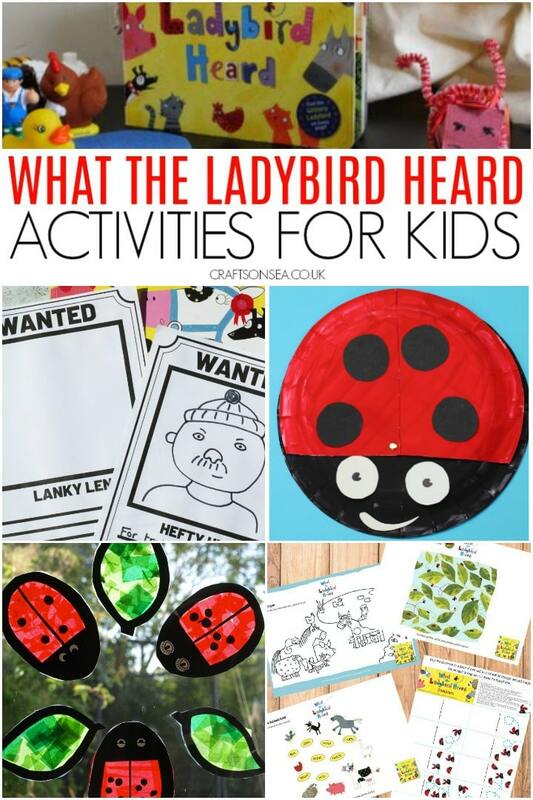 There are some great free printable activities over on Kiddycharts which has got a What The Ladybird Heard colouring sheet, dominoes, find the ladybird activity and an activity to match the animal to the noise that they make. The Gruffalo site has a free downloadable pack for some of the stories created by Julia Donaldson and illustrated by Lydia Monks, as well as activities for The Singing Mermaid and The Rhyming Rabbit (amongst others) it has a wordsearch and a printable activity sheet for drawing the Snuggly Snerd from What The Ladybird Heard Next. Want to create some of the farm animals from the book? Try out this easy pig craft, this sheep, or this ‘not quite a chicken craft but I think it’s close enough’ chick craft. Red Ted Art share a sweet handprint ladybird craft as part of their handprint alphabet series. Housing A Forest shares a ladybird craft that you can make using recycled cardboard. 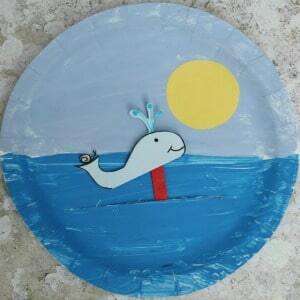 This paper plate craft for The Snail and The Whale is movable so your characters can sail across the ocean, can you see the little snail on the whale’s tail? 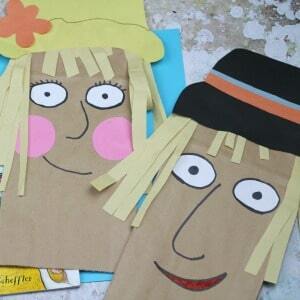 Make this The Scarecrow’s Wedding paper bag craft which can be used as puppets too! Have you read Sue Hendra’s Supertato books? 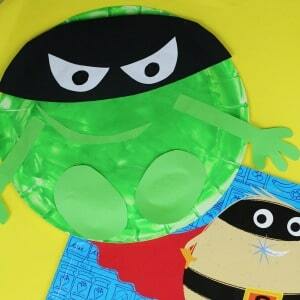 We love them and this Evil Pea paper plate craft is perfect to make alongside the books.